Dr. Snigdha Singh is a highly skilled ophthalmologist with a primary focus in LASIK, Glaucoma Management and Cataract surgery with new technology lens implants. She also performs Diabetic eye exams and routine eye care. Dr. Singh is board certified by the American Academy of Ophthalmology and is VISX certified to perform CustomVue® Advanced LASIK. She has also had LASIK performed on her own eyes and can relate to her patients' concerns with unique insight and perspective. After receiving numerous scholarships, Dr. Singh graduated from the University of Michigan in 1989 with two Bachelor of Science degrees, and Indiana University School of Medicine in 1993. Dr. Singh was named “Intern of the Year” at St. Joseph Mercy Hospital in Ann Arbor in 1994 for her outstanding skills and compassion. She then finished her ophthalmology residency in Ohio in 1998, where she had the honor of serving as Chief Resident in her final year. 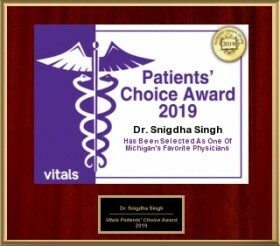 Dr. Singh received the Top 10 Doctor Award 2014 and the Patients' Choice Award 2012 through 2015 from Vitals.com, a leading physician review site. Dr. Singh has been performing LASIK vision correction and cataract surgery for more than a decade. Her LASIK results are better than those achieved in the national study for LASIK surgery. This is in part due to her surgical skills and knowledge, but also due to the technologically advanced equipment used at Castleman Eye Center. 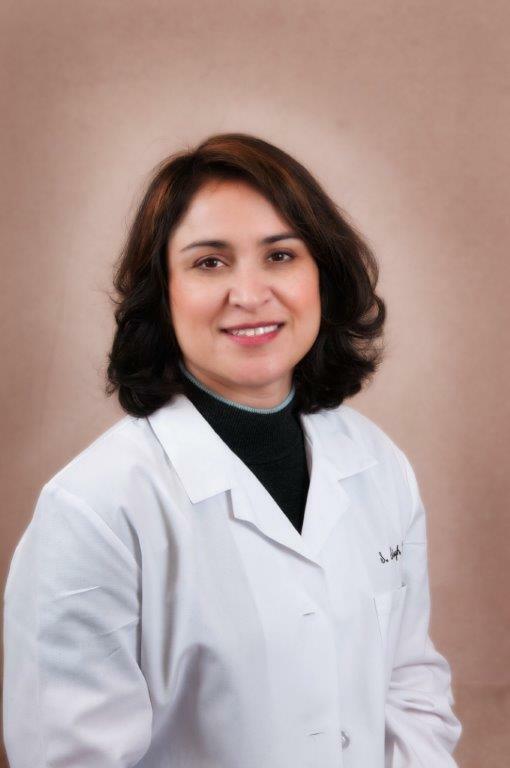 Dr. Singh is certified in: VISX Star 4 Laser with Iris Registration, Bausch & Lomb Hansatome and Intralase. 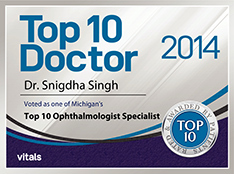 Dr. Singh has been practicing ophthalmology in southeastern Michigan since 1998 and has performed thousands of cataract and laser vision correction surgeries. She has given numerous lectures to residents and doctors at various hospitals in the area, including Beaumont, St. John, and Crittenton. She has also provided seminars for the general public at local senior centers, clinics, hospitals and schools. In the past, Dr. Singh has been involved in the research side of medicine as well. She has contributed her knowledge and efforts to research projects throughout the nation. Dr. Singh's biggest practice builders are her patients, because they refer so many friends and family. Patients truly appreciate a doctor who treats them with respect, answers their questions and provides them excellent eye care with a personal touch. Dr. Singh accepts most insurance plans and sees patients at our Southgate and Troy offices.